Last week, we identified the ten Most Difficult Examiners currently reviewing applications at the USPTO. By understanding how an examiner has performed in the past, patent professionals can manage client expectations and structure a prosecution strategy that maximizes an application’s likelihood of allowance. Through Juristat’s Examiner Reports, you can dive deeper into the decision-making mindset of each Examiner by seeing his or her typical prosecution process from application to disposition. Below, we have created two charts, one that highlights the top 25 firms that have prosecuted applications in front of these Examiners, and another that highlights the top 25 assignees. Remember that this information refers to applications disposed between January 1st, 2008 and December 31st, 2017. We dug a little deeper, and here is what we were able to find for each examiner on our list. Examiner Michael Sittner primarily reviews applications in AU 3622 (patents relating to data processing in business practice). He has reviewed 102 applications in the past ten years, with a 0.98% allowance rate. 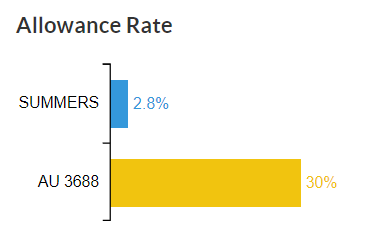 Sittner’s rate is still within 10 percentage points of the overall average allowance rate for AU 3622, a notoriously competitive art unit. Examiner Patrick McAtee primarily reviews applications in AU 3689 (patents relating to data processing in business practice). He has reviewed 185 applications in the past ten years, with a 0.99% allowance rate. 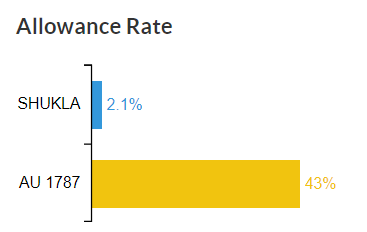 McAtee’s rate is still within 10 percentage points of the overall average allowance rate for AU 3689, a notoriously difficult art unit. Examiner Krupa Shukla primarily reviews applications in AU 1787 (patents relating to stock materials). She has reviewed 145 applications in the past ten years, with a 2.07% allowance rate. 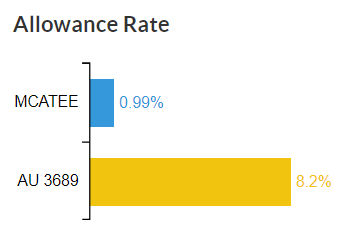 Shukla’s rate is well below the average allowance rate for AU 1787. Examiner Kiersten Summers primarily reviews applications in AU 3688 (patents relating to data processing in business practice). She has reviewed 107 applications in the past ten years, with a 2.80% allowance rate. Summers’s rate is well below the average allowance rate for AU 3688. Examiner Jeffrey Piziali primarily reviews applications in AU 2625 (patents relating to selective visual display systems). He has reviewed 259 applications in the past ten years, with a 3.47% allowance rate. 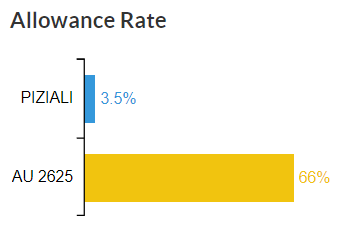 Piziali’s rate is well below the average allowance rate for AU 2625. Examiner Sharmila Landau primarily reviews applications in AU 1653 (patents relating to fermentation, microbiology, and isolated/recombinant proteins). She has reviewed 136 applications in the past ten years, with a 3.68% allowance rate. Landau’s rate is well below the average allowance rate for AU 1653. Examiner Aryan Weisenfeld primarily reviews applications in AU 3689 (patents relating to data processing in business practice). He has reviewed 107 applications in the past ten years, with a 3.74% allowance rate. 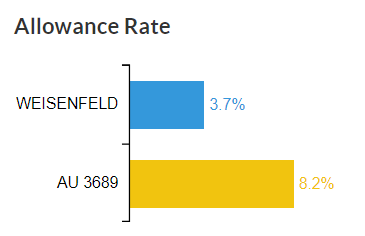 Weisenfeld’s rate is within 5 percentage points of the overall average allowance rate for AU 3689, a notoriously competitive art unit. Examiner Julie Shanker primarily reviews applications in AU 3689 (patents relating to data processing in business practice). She has reviewed 132 applications in the past ten years, with a 3.79% allowance rate. 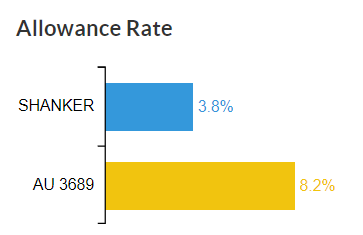 Shanker’s rate is within 5 percentage points of the overall average allowance rate for AU 3689, a notoriously competitive art unit. Examiner Scott Gartland primarily reviews applications in AU 3622 (patents relating to data processing in business practice). He has reviewed 329 applications in the past ten years, with a 4.26% allowance rate. Gartland’s rate is within 10 percentage points of the overall average allowance rate for AU 3622. Lower than other Examiners in the art unit, but not a terrible departure. Examiner Rodney Henry primarily reviews applications in AU 3681 (patents relating to data processing in business practice). He has reviewed 211 applications in the past ten years, with a 4.74% allowance rate. Henry’s rate is well below the average allowance rate for AU 3681. Armed with this information, patent prosecutors have access to historical context that can shape prosecution strategy. Juristat Examiner Reports offer a robust profile of each Examiner, organizing years of data to highlight trends and suggest best next steps to increase the likelihood of an allowance. Whether your application is assigned to one of these Examiners or not, our Examiner Reports will provide context for your patent prosecution decisions, revealing the best pathway to success. Arm your team with the necessary data for a successful prosecution by scheduling a demo here.